After a couple of crazy weeks, we’re back with new video from M2 Hockey & HockeyShare! This week we wanted to do something a little bit different than normal. This week’s video is a skating circuit that’s meant to be gone through in succession without rest. As players become better skaters and get more comfortable with the drills, the tempo can be increased, and modifications can be made to the circuit. These fundamental edgework drills are the foundation for almost every skating maneuver in hockey – so you can never get enough practice on them. For those who don’t think power skating is important, here’s a sobering fact: NHL teams do power skating!!! The more efficient you become on your skates, the better overall hockey player you will become. Hope you enjoy the video! Any coach would take players like these in a heart-beat. It’s not hard to see why players who don’t meet one or more of the above criteria may cause frustration for the coach. Is it easier to be around and work with a player who gives 100% every shift, or one that goes out and skates half-speed and takes bad penalties? Easy answer, right? Here is the key in dealing with your players. All of them – favorite or not – need to be treated equally. Rules need to be enforced the same amongst all the players from top to bottom. This isn’t to say your approach with each player should be identical, but guidelines need to be set for behavior, and whether or not your favorite player or least favorite player violate a guideline, the punishment needs to be equal. If the “punishment” for being late to a team function is to sit the first period of the next game, the rule needs to be enforced with each and every person. It’s OK to have favorites – just be aware of how you treat them, and be sure you’re holding them to the same standards you’re holding your “least favorite” player to. If there is a big inconsistency, you’ve got a sure-fire formula for disaster within your own team. Players will begin resenting each other, parents will turn on you, and you’ll have a lot less fun coaching. Tripping (Clipping) – When a player dives to poke the puck away from an opponent and makes contact with the puck (first), but takes the opponent down, many believe no penalty should be called because the primary play was on the puck. Should it be a penalty or not in youth hockey? NHL Rule #60 – High-sticking: Rule #60.2 dictates minor penalty criteria: “Any contact made by a stick on an opponent above the shoulders is prohibited and a minor penalty shall be imposed.” Rule #60.3 dictates double-minor penalty criteria: “When a player or goalkeeper carries or holds any part of his stick above the shoulders of the opponent so that injury results, the Referee shall assess a double-minor penalty for all contact that causes an injury, whether accidental or careless, in the opinion of the Referee.” The next rule (60.4) dictates the criteria for a Match penalty. There is no verbiage for a major penalty on a high-sticking infraction in the NHL official rules. Don’t be surprised if the officials aren’t aware of these differences. The game is so complex and the rule book is so long and specific, it’s almost an impossible task to know every rule perfectly. When you also factor in many high level officials are officiating in several different leagues – each with their own set of particularities – it can be a daunting task to keep everything straight. Honest officials are trying their best to ensure an unbiased game. In youth hockey, we’re all out here to learn and improve. Help officials in a positive, productive manner understand the differences if they are in error. The last two Hawks games I got to watch, I’ve had the displeasure of seeing two hits I’d rather not ever see in the game. The first was Alex Ovechkin hitting Brian Campbell from behind, the second was former Hawk, James Wisniewski with a head-shot to Brent Seabrook. Both hits unfortunately led to injury. Both plays were examples of hits the NHL (and USA Hockey & Hockey Canada) wants to see out of the game. While many can argue over how many games each player deserves for their actions, I think these scenarios provide a great teaching opportunity for youth players. In this particular instance, Ovechkin and Campbell were racing to a loose puck near the goal line. Campbell, the first one there, was in front of Ovechkin in a clearly vulnerable position. Campbell was: 1) a dangerous distance from the wall 2) not facing Ovechkin 3) never had a chance to defend himself. Ovechkin proceeded to shove Campbell from behind. As bad as the injury sustained by Campbell was (collar bone and ribs – I think), it could have been a lot worse. In that split second, it wouldn’t have been impossible for him to have gone into the wall head first. Players need to understand the dangerousness of checking from behind – this single moment in lapse of judgement could have led to something far worse than it did. If the player isn’t facing you, don’t check or push him/her. 1) Interference – Seabrook did not have the puck, nor was he the last one to touch it. The only intent of the check was to retaliate. 2) Charging – Wisniewski is a defenseman. He came in from the tops of the circles with his only intention to make a hit. When he finally came barreling in, he left his feet. 3) Head Contact – The hit was high to begin with, then he followed through with his hands to the face of Seabrook (see freeze-frame below) which drove his head into the wall. All these aspects of the hit make it a dirty one. Coaches must teach players the basics of proper checking technique, but moreover need to emphasize from a young-age that the only reason to check is to separate the player from the puck. Hopefully players and coaches alike can use these two negative instances and take positive lessons from them. HockeyShare is based on the premise of sharing information between users. Many coaches have many staple drills in their repetoire, but don’t necessarily have them in a program like DrillDraw to share easily. No problem here – if you’ve got a hand-drawn image, excel file, pdf, it doesn’t matter – you can upload them to HockeyShare. We’ll take care of converting them and formatting them for the website. Simply use the drop-box below to add your files. Thanks for helping the community grow! This video is related to the previous titled Shooter Tutor – Evolved. In this video, Brett covers a specific shot from the slot area on butterfly goaltenders. Hockey can have one of the longest seasons – many going from August through March (or longer). Many players/families jump right into spring hockey the minute the regular season is over. Personally, I don’t believe this is the best choice for most athletes. After a long physically, mentally, and emotionally draining season, even the most die-hard hockey fanatics need to take some time to recharge their batteries – especially in youth hockey! Players need time away from the demands of the sport to allow their body to recover in all three areas. 1) Physical – this one is pretty obvious. As players get older, the game gets more physically demanding. Coaches push players harder in practice, opponents & teammates hit harder, the speed increases, and injury rates increase. Physical ailments that seemed minor, if left untreated, can turn into long-term injuries. Bodies need the opportunity to recover. 2) Mental – teams go through lots of ups and downs throughout the course of a season. These swings provide some of the best life lesson teaching opportunities – but they also can wear players, coaches, and parents down by the end of the year. Give players the opportunity to think about things other than hockey for a while. 3) Emotional – did your team play in a big game this year? Win or lose, I’m sure emotions on both benches were running high. All players need some time away from these emotionally demanding moments. Over-exposure to these scenarios can actually lead to physical ailments. People who are emotionally and mentally drained are more likely to become sick – it boils down to your body only having a certain amount of energy to cope with situations. When you’re low on energy, your immune system becomes vulnerable. USA Hockey recognizes the number one reason for players dropping out of the sport is because they aren’t having any fun. If hockey becomes a mundane task, it’s no fun. Time off from the rink is healthy – it helps keep the game special. It’s no different than having a sports car in your garage – if you drive it everyday, it just becomes “another car” – but if you save it for your summer weekend cruises, it becomes something special. Let kids be kids – give them time away from the sport, even if it’s just a few weeks. Allow them to play other sports and have unstructured time, they’ll enjoy the game that much more when they come back! Hopefully I’ve convinced you to take at least a few weeks off after your season wraps up. I want to be very clear on one thing though – I don’t discourage off-season hockey and/or training! In fact, I think (smart) training in the off-season can greatly benefit players. 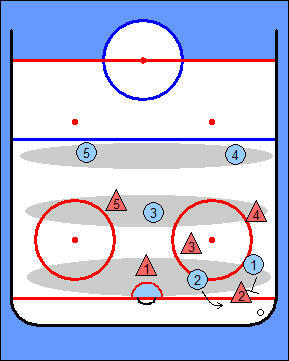 My personal preference for the spring is to provide some sort of non-contact, loosely structure opportunity for players to be on the ice no more than once or twice per week. Like it or not, as coaches, we have to accept the fact that players will probably learn just as much (if not more) from having unstructured ice time and getting to try things on their own in a pressure-free environment. As players get older, the number of training options in the off-season increase. Older players can start to get into strength and weight training. This is a great opportunity to improve your overall fitness and strength while still giving your mind & body a break from being on the ice. Is it hard work? Sure – but it’s different work. Finally, I do encourage players to find camps & clinics throughout the summer to help hone specific areas of your game. Look for camps focusing on areas of weakness. If you want to become a better defenseman, look to find a defenseman camp…if you’re looking to score more goals, look for a shooting or goal scoring camp or clinic. You get the idea. There are hundreds of choices for hockey camps – ask around and find one you think will help, and remember…the most expensive camp isn’t necessarily the best! If you’re a parent – don’t push your kid to the point where they’re ready to drop out of hockey. If you’re a player – go relax and be a kid for a couple weeks…let your body heal! If you’re a coach – allow players the freedom to hang up the skates for a bit, and don’t pressure them into competing year-round. Skate hard & keep your head up. See you around the rinks…and Minnesota lakes this summer! Well, now that the season has come to a close, this is the final posting for my full-season of practice plans. I hope you’ve enjoyed the entries and have found some value in them. If you have questions about any of the practices, don’t hesitate to drop me a line.